Does the idea of a “no-dig” vegetable garden sound appealing to you? Then read on, because I have good news for you – especially if you are interested in growing organic vegetables. Saves Your Back. What’s not to love about avoiding back-breaking physical labor whenever possible? More Effective. Digging has been shown to be ineffective in areas that have thin topsoil. Therefore, some assume that it is not really beneficial in any kind of soil – but richer soils are better able to handle the damage done. For digging to work in agriculture over a long period, the soil has to be rested with fallow crops at regular intervals. 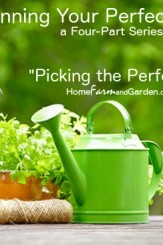 Most gardeners do not do this in their gardens – and the soil suffers as a result. Preserves the Soil. One of the main advantages of having a “no-dig” veggie garden is it preserves the natural food web which exists in the soil. This includes all kinds of soil-based organisms which produce the nutrients necessary for your plants to thrive. Plus, they help fight off certain pests and diseases. When the soil is dug and turned, this delicate natural balance is disturbed, which causes stress and destroys some elements of the food web. Supporters of digging will point out that it allows you to remove the roots of various weeds. This is true, but it also allows weed seeds that are buried in the soil to come to the surface and germinate, so the net result may not be in your favor. If you have a “no-dig “vegetable garden, simply remove any weeds as soon as you see them, and they will not become established. If you are creating a brand new “no-dig” vegetable garden, put thick layers of newspaper or cardboard down first – this will smother any grass or weeds that are already there. Next, add a layer of mulch onto newspaper or cardboard. This mulch should be made up of organic matter such as shredded newspaper, straw, sawdust, etc… This will hold in moisture and prevent any deep rooted weeds from making it to the surface in the first season. However, it needs to be something that will break down over time so that beneficial organisms can break through it. 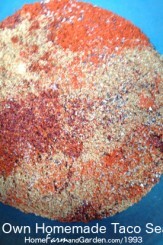 Next, add a layer of compost or other nutritionally rich matter (such as well-aged manure). Tip: If you are buying compost, be sure to buy organic! If your garden is already established and you have perennials that you do not want to remove, simply place the mulch and compost around the existing plants. Some “no-dig” vegetable gardens are grown in raised beds. In fact, that is how I do it here at my place. I find this method to be very effective because it raises the plants up to a comfortable level, plus keeps the bunnies (and my tomato-loving dog, Reilley) from going to town on my harvest. Plus, it creates a nice snack bar for the neighboring deer. 🙂 ~ Just kidding! I’ve never had an issue with deer here. Not sure if its because of the horses (I’ve heard they’ll avoid horses whenever possible) or if its just the abundance of corn and other crops nearby. Whatever the reason – I’m thankful for it! To create a raised bed garden, you’ll need something for the perimeter of your beds, such as wooden planks. (Be sure NOT to use pressure treated lumber for this). Then, place a layer of mulch, followed by a layer of compost and repeat to the required depth. Lower layers can be made up of compostable matter such as grass cuttings and food peelings rather than finished compost, if you wish. You’ll need to keep adding to this layering mixture over time as it will break down and become more condensed. 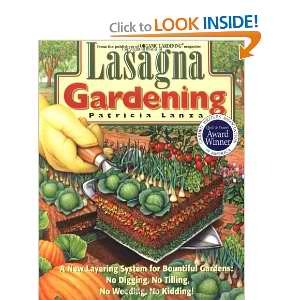 Note: This type of “no-dig” vegetable garden is known as “lasagna gardening” – which is my personal favorite method!